What’s the best way to get around Florence? On foot, bicycle, taxi, bus, rental car? This is one of the most frequently asked questions from our vacation rental clients when planning sightseeing itineraries and trying to judge time for getting around Florence. The short answer is: Florence is easy to get about. It is small and many of the popular sites and nice neighborhoods are walkable. On typical itineraries, the farthest apart points are the Boboli Gardens and the Accademia which distance is only 3 kilometers, less than 2 miles, with many of the glories of Florence in between. Streets and sidewalks are narrow and can be quite crowded during peak hours, often cobblestone, curb cuts are not guaranteed. In general Florence is a safe city, but normal city precautions: don’t leave items unattended, carry your purse bandolier style, backpack in front, waist wallet, wallet in front pocket. Public transportation, should you need it, is readily available and reasonably priced. Use the transportation site to figure out your route. There are busses and trams throughout the city and they can also connect you to nearby towns and suburbs. 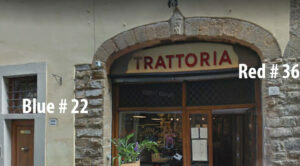 For example, it is easy to visit Fiesole, a nice outing described in this blog. And our gorgeous Villa Amata is in the town of Impruneta an easy bus ride, too. 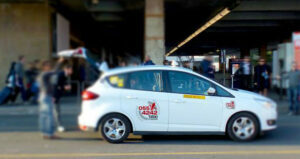 Taxis are reasonably priced. Hailing cabs isn’t done, best to look for taxi stand. You can call a taxi using these #s 055.4242 / 055.4390 / 055.4798 / 055.4499. The Florentine taxi drivers have “saved the day” for us and our clients several times, so good folk in our experience. Uber is in Florence at the time of this article, but embattled with legal issues so best not to count on it. Many Florentines get around the city by old-fashioned bicycle. It sounds idyllic but we don’t recommend it. There are bike rental locations throughout the city but it is not very safe and there is the dilemma of where to safely park a bike. When you are first arriving at your accommodations in Florence, take a taxi. Street names and numbering are unique and can be confusing. Red numbers for businesses, blue or black numbers for homes that don’t necessarily coincide. Sometimes street numbers are odd/even and sometimes not. Street names can switch frequently. Charming after you are settled. The airport is relatively close to the city center, usually about half an hour’s drive. There is a fixed price fare from the airport to accommodations in the city. Don’t plan on driving into Florence yourself. If you get inside the limited traffic zone (see this article on the topic) you could get a giant fine a year later and the rental car company will hound you for life, or something like that; you’ll see all kinds of such drama online. If you can drop a rental car for your stay, best. Otherwise, there are parking garages that run in the range of €40/day. We are happy to help our guests figure out their best strategy for arriving and moving about Florence. Photo credit: Wikimedia Steve Hersey.